The chairperson can use the dial-out feature at any time during a conference call. The call Leader can choose to dial-out to a participant located anywhere globally using a simple keypad command as illustrated below. 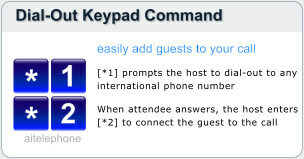 If the host uses the dial-out option, the attendee's phone rings. When the call is answered that participant is joined into the conference call immediately. Some customers use dial-out it to reduce costs because dial-out rates are usually lower than toll-free rates, depending on the country. Another common use for using dial-out is to bring a third party into a meeting after others have had a pre-conference. For instance, this might be required during a job candidate phone interview. The dial-out rates also apply if the chairperson or an attendee uses the included Connect App. The rates below apply when the moderator uses the included dial-out feature to add attendees to an international conference call. The dial-out feature permits joining participants to your call even if they may be in a remote part of the world that has no alternative access numbers. In addition, dial-out rates are typically lower than toll-free dial-in rates -depending on the country of the participant. So, not only is dial-out very effective for remote attendees, it can also save money. The dial-out feature and the Connect app are included with your account should you wish to use them.